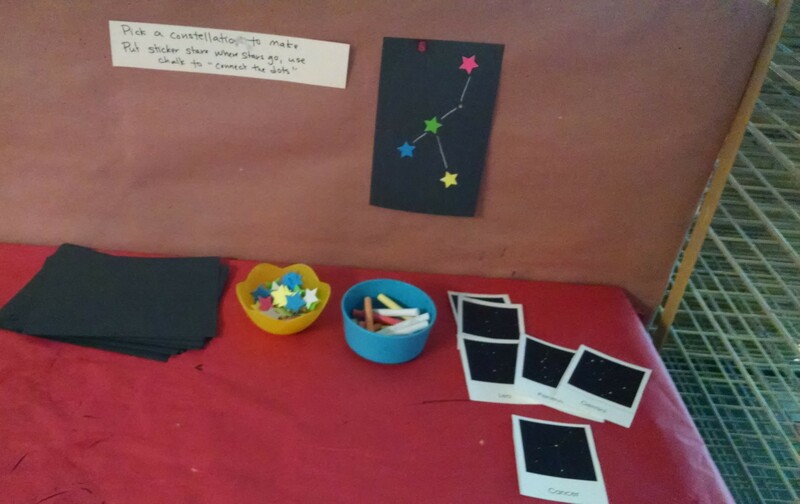 Our class theme this week was Astronomy – Stars and Constellations. 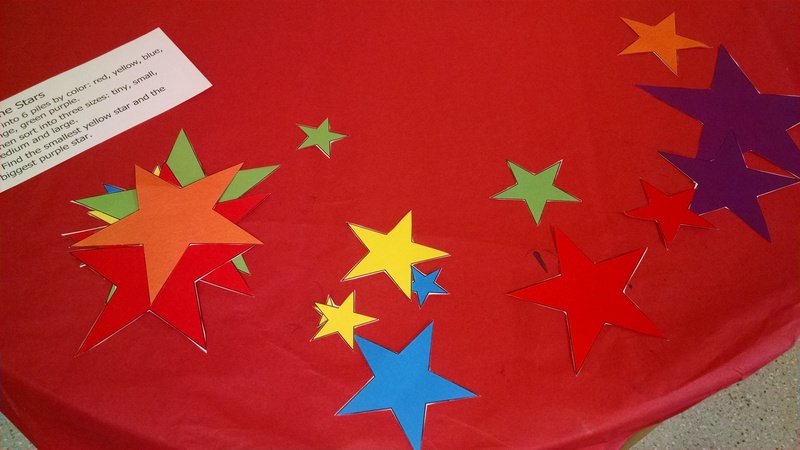 The big question for our preschool age kids was: What’s a star? (And what star is nearest to your home?) 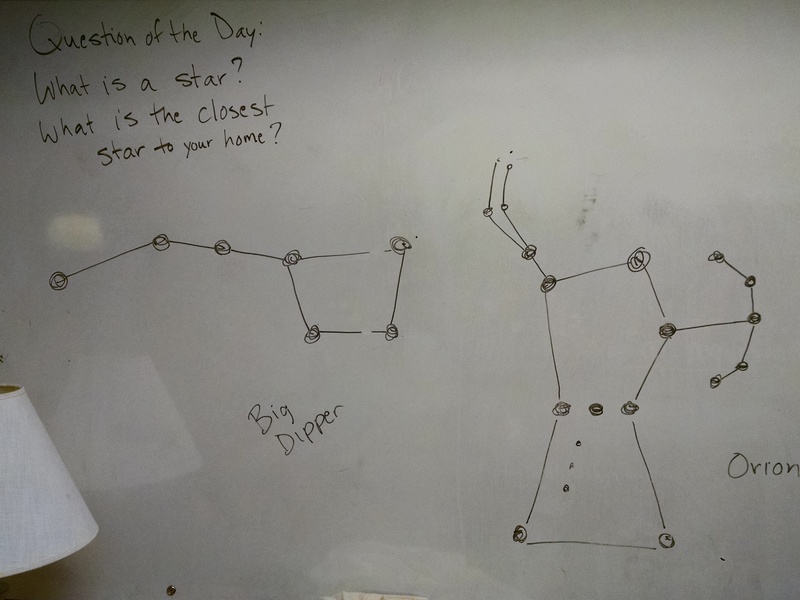 For older kids, we asked them “what’s a constellation”? 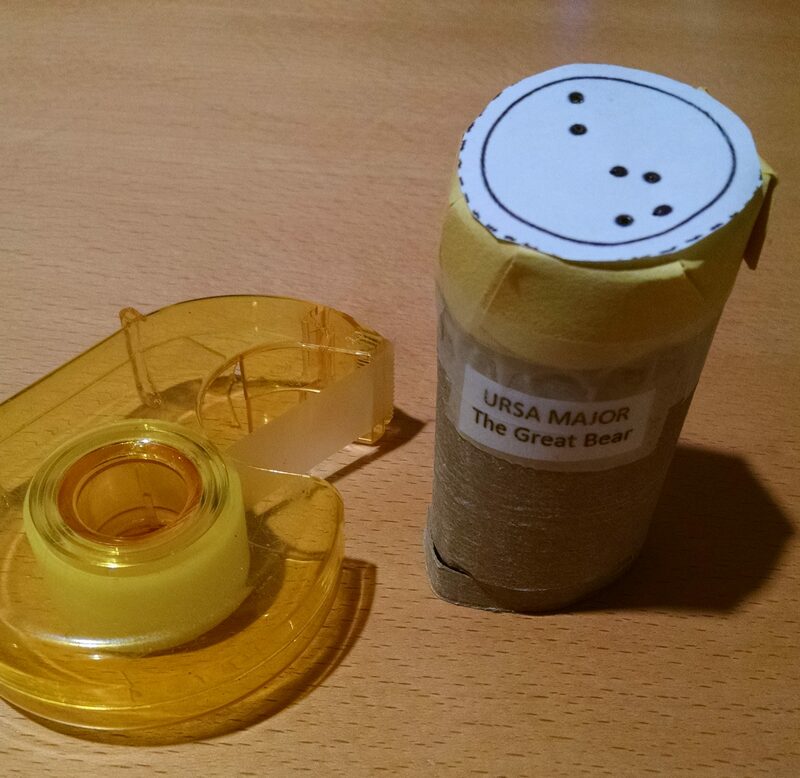 Make a constellation viewer. Cut out a constellation pattern, glue it to some black paper, tape that over the end of a toilet paper tube, then use a thumb tack to punch holes everywhere there’s a star. Voila – you’ve made a viewer that when you look through it, you see the constellation. You can shine a flashlight through the tube to project the constellation on the wall. More how-to details / tutorial here. Make a constellation projector. Kids took a large margarine tub (or a cardboard snack tray) and placed it bottom up on the table. Then they taped a constellation pattern on the tub. They then used either thumb tacks or nails and hammers to poke holes in the tub everywhere a star appeared on the star chart. 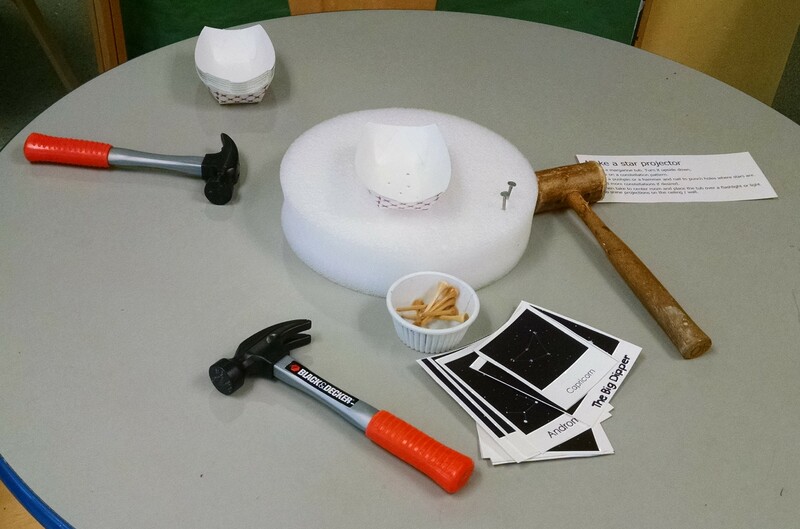 (The thumb tacks were plenty strong to poke the holes, but kids enjoyed using the nails and hammers.) When finished, they could place the tub over a flashlight or lantern and project the constellations on the ceiling. 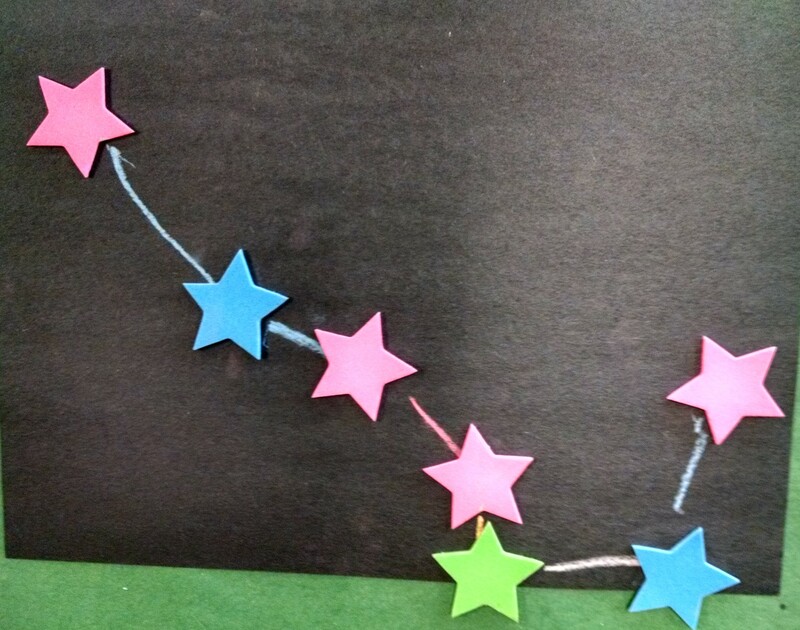 Why do stars twinkle: Kids can trace star templates onto foil, cut out the stars and glue them to black paper. Then take them to a dark room. When you shine a flashlight on the stars, what do you see? Now place a small glass bowl of water on top of the star and shine a light through. Now jiggle the water and look again. Or hold the water up by your eye, and look through it at the foil. You may see that looking through moving water makes the stars look like they’re twinkling, like when we look through our atmosphere the stars twinkle. The Educated Preschooler and M.A.R.S. Astronomy Club talk about this experiment. It was not as clear an illustration of the idea as I was hoping for. 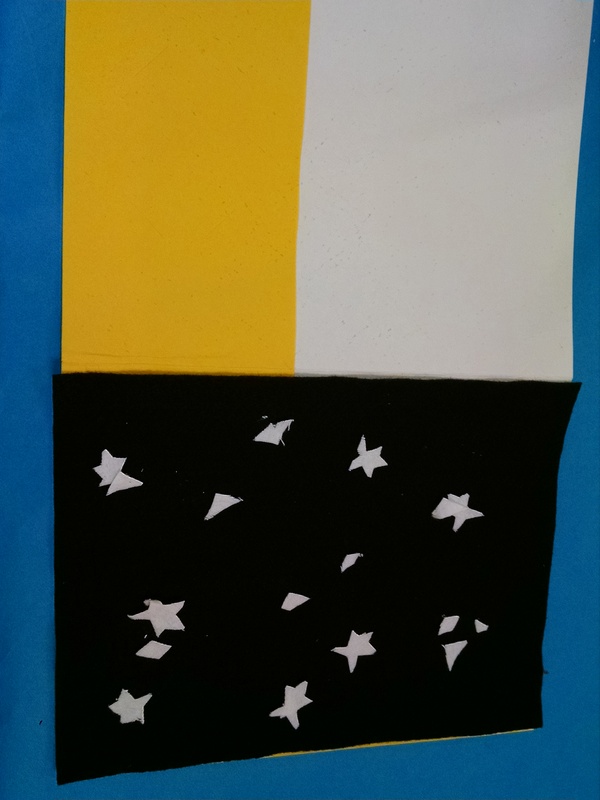 Make a star chart felt board. Kids took a folder, opened it up and glued black (or deep blue) felt to one side. 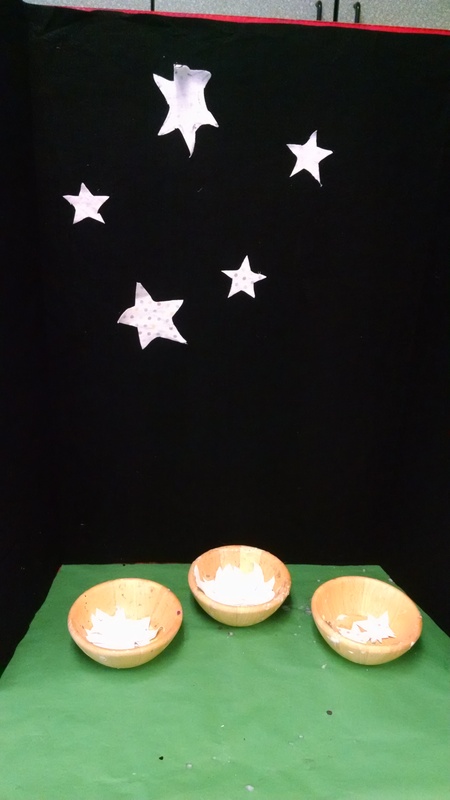 Then they cut out white felt stars and moon that they could use to lay out constellations. When done, they can store the stars in the pocket of the folder. Alternatively, you could just make one large felt board and stars for them to play with. 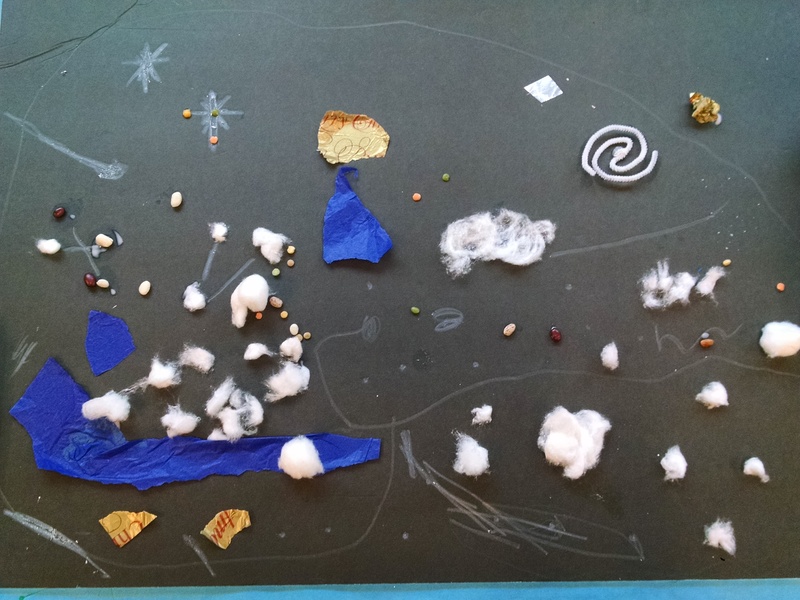 Collaborative Collage: We put out black foam core, white crayons, glue, cotton balls, legumes, and other items to represent stars, and encouraged kids to create a “night sky.” Mrs. Myer’s Kindergarten has a really nice example of one of these. 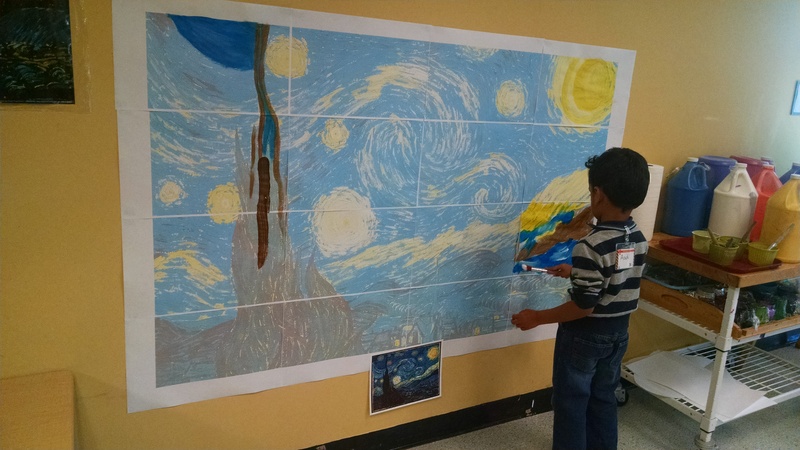 Starry Night: Last year, we had a poster of Van Gogh’s Starry Night next to the easel, and put out the paint colors needed for it and big brushes so children could try to duplicate it some of the swirls of color. This year, we instead: found a high res image of the painting online, created a document that was 44 x 68″ (a 4×4 grid of 11×17 paper) with that image blown up to that size, then we made it 70% transparent so that a washed out version of it would appear. 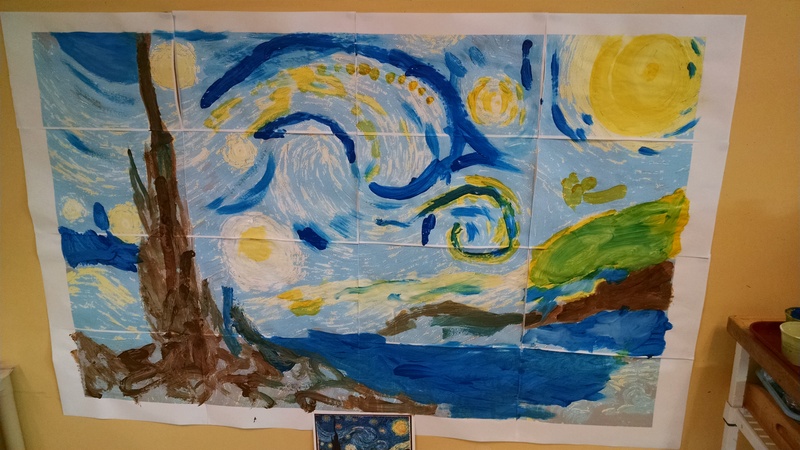 We printed that, stuck it to the wall, and had kids paint onto it, tracing the shapes of Van Gogh’s brush strokes. Pocket star: In closing circle, we would sing a song about putting a star in your pocket, and read a book about that too, so we wanted to make pocket stars. I had to think of something small, but sturdy, that had a star shape yet didn’t have a lot of poky edges. 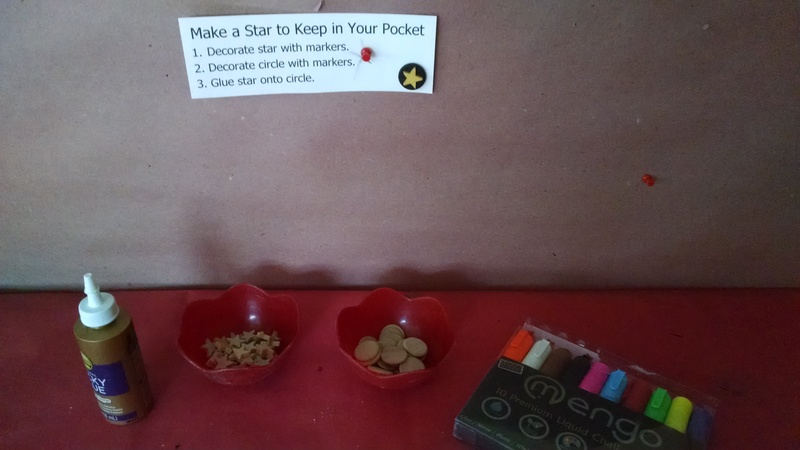 We bought Wood Stars and Wood Disks , which we decorated with Chalk Markers and glued together with Tacky Glue. We had 3/4″ stars and 1″ wood disks, which were really pretty small – you could go a little bigger. I should note: chalk markers are designed for writing on non-porous surfaces, like chalkboards or glass, then washing off with water. When you use them on wood, they soak into the wood as well as a paint marker or a Sharpie does, but they wash off kids’ hands, so they’re perfect for a project like this. Glow in the Dark Sticker Constellations. 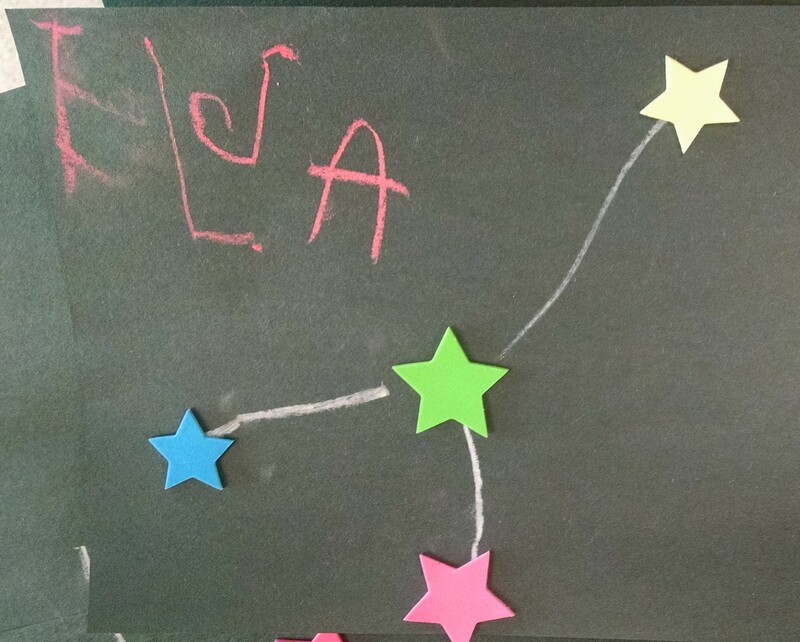 We had black paper (we put out half sheets, but learned full sheets would have been better), Glow in The Dark Sticker Stars , and these constellation cards and chalk. I got this idea from Artsy Momma. You could do this with gold stars if you already have those, as they do on Gift of Curiosity. 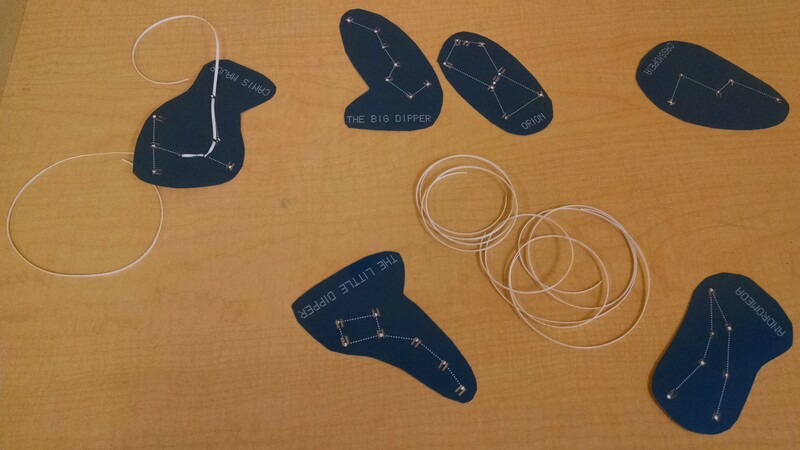 There are lots of materials you could use to make constellations – glue gems on paper, or marshmallows, or stick together marshmallow and toothpick constellations, etc. Art / Engineering Challenge: Star Mobile. Last year, we had cardstock they could glue aluminum foil to and then cut out stars. (That’s the art / small motor practice part.) Then, they moved to another table to assemble a mobile. Figuring out how to balance the arms of a mobile is definitely an engineering challenge – deciding how long the strings should be, how many items to put on each arm so it balances, and so on. This project was aimed at our 5 – 7 year olds and was definitely a challenge for them and their parents. Both parts (making the stars and making the mobile) were too challenging for our little ones, so we didn’t do this project this year. It would be great for 8 – 10 year olds. 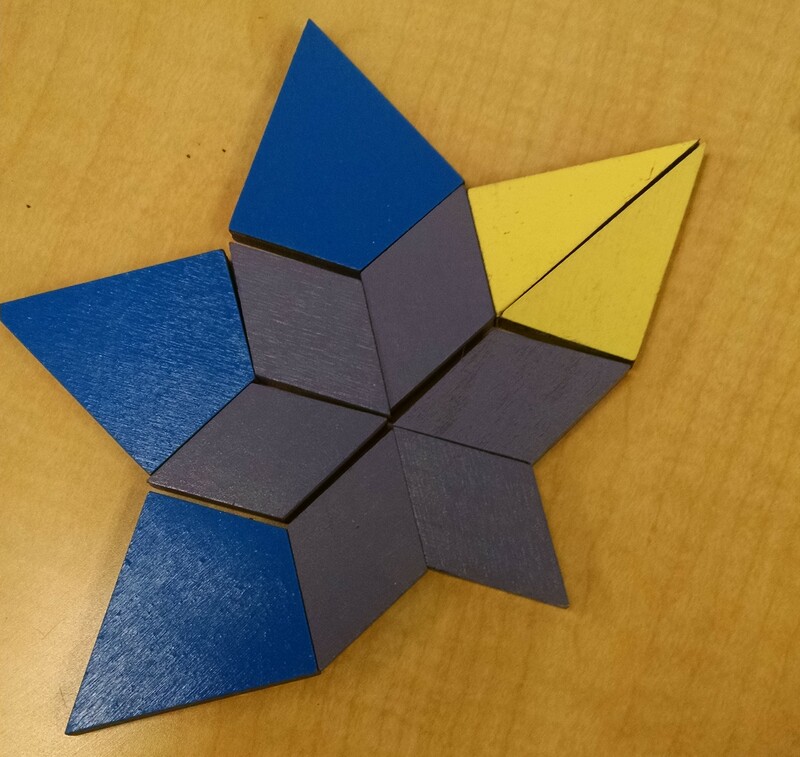 Pattern Blocks: We used the 21st century pattern blocks from Talking Math with Kids to make stars. Coloring / Connect the Dots: We also considered having a project where kids could connect the dots to form constellations, then color them in. If you search for “constellation coloring pages for kids” you’ll find lots of options for this. 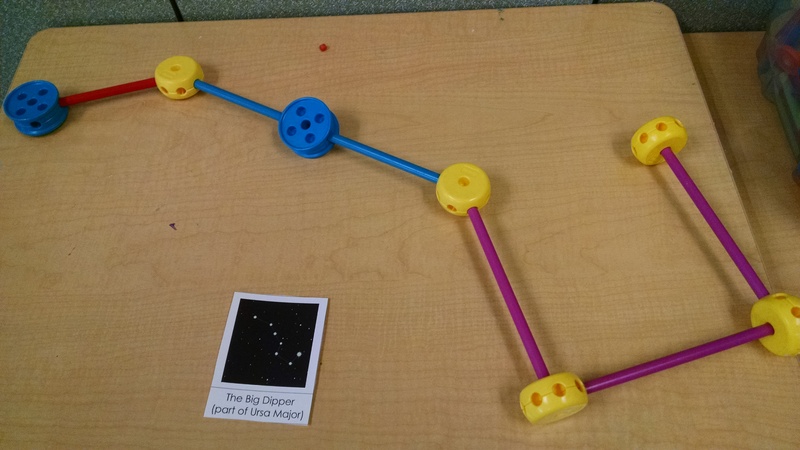 Giant Tinker Toy Constellations: We have a set of giant tinker toys. 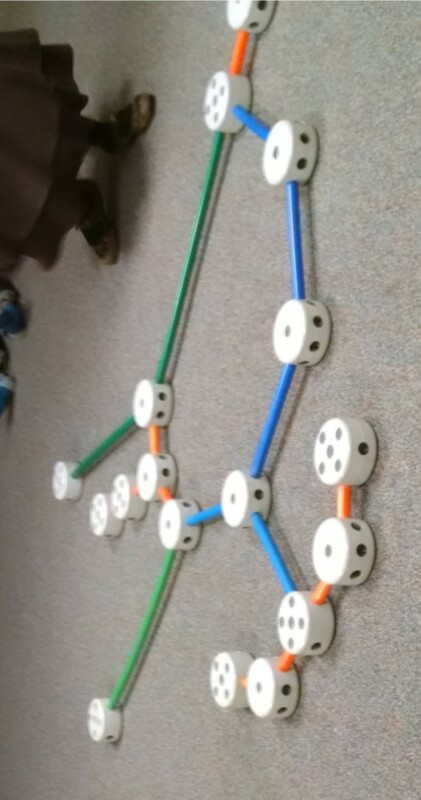 We drew three constellations on the board, and encouraged kids to replicate them, using the “hub” pieces of tinker toys as stars, and the “tubes” to connect them into constellations. 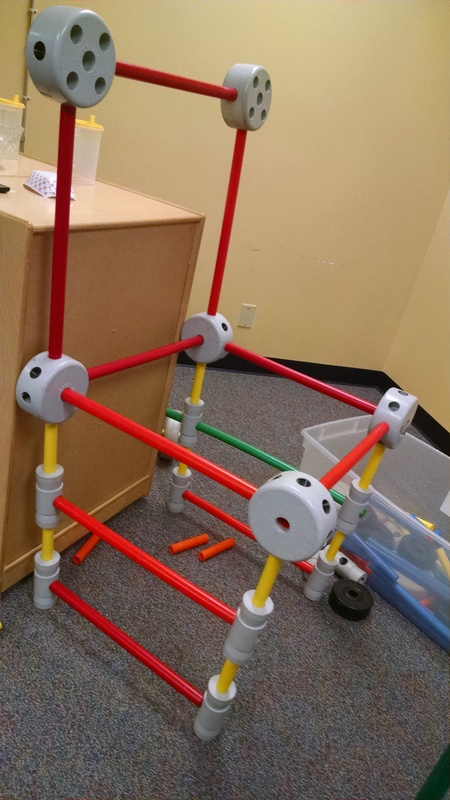 To be honest, the kids used the tinker toys as construction toys, and built blasters, light sabers, lawn mowers, chairs, etc. 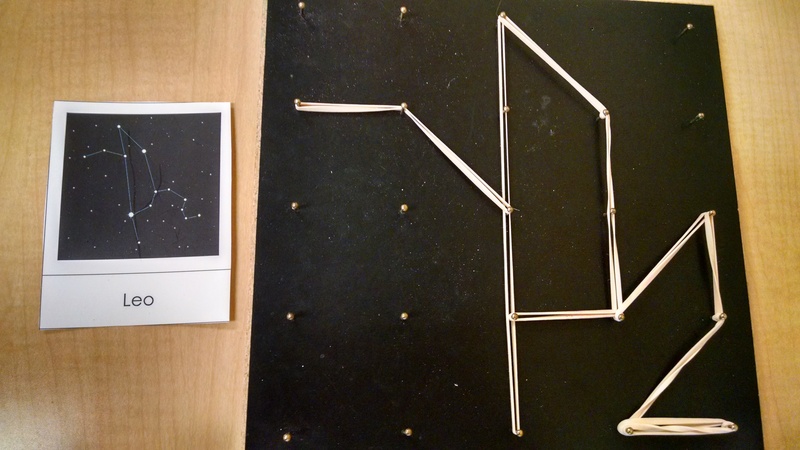 But one of the dads built a great model of the Orion constellation! 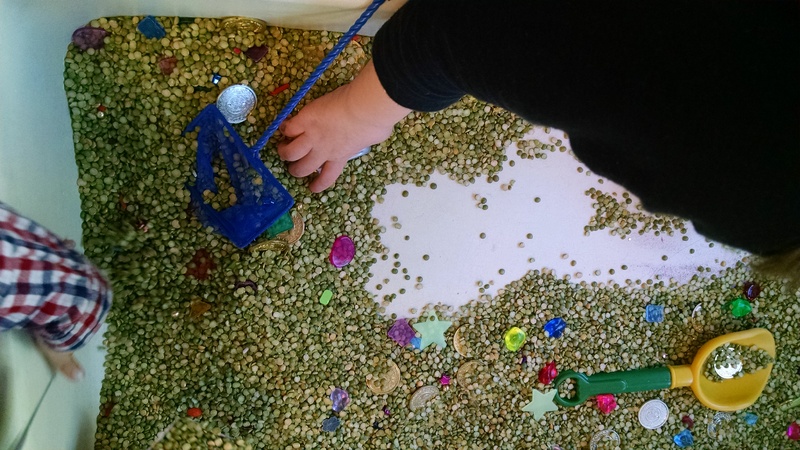 Sensory Table: We use purple sand or green split peas with “gems” and “coins” and star shapes mixed in, and star shaped containers to fill and pour. 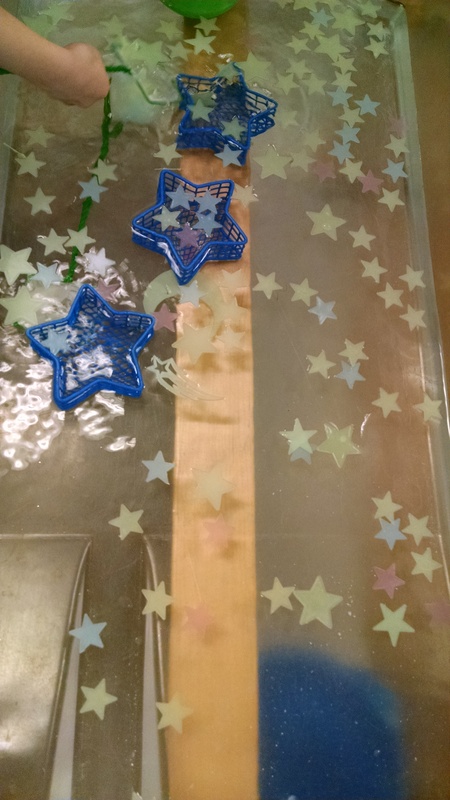 Water Table: We mixed in plastic Glow in Dark Stars. Next year, we might try doing the water table in a dark room so you’d really get the effect of the glowing stars. Sewing Stars: We found these cards on Kids Activities Blog. We printed, laminated, punched holes with our 2″ reach Hole Punch that punches an “equals sign” shape that is great for running ribbons through. We put this out with plastic lanyard string. One thing I discovered: the best constellations for this project are things like Cassiopeia or Andromeda where you’re always moving in one direction. Constellations like Canis Major have “dead ends” that mean you have to double back on the lacing which is hard. 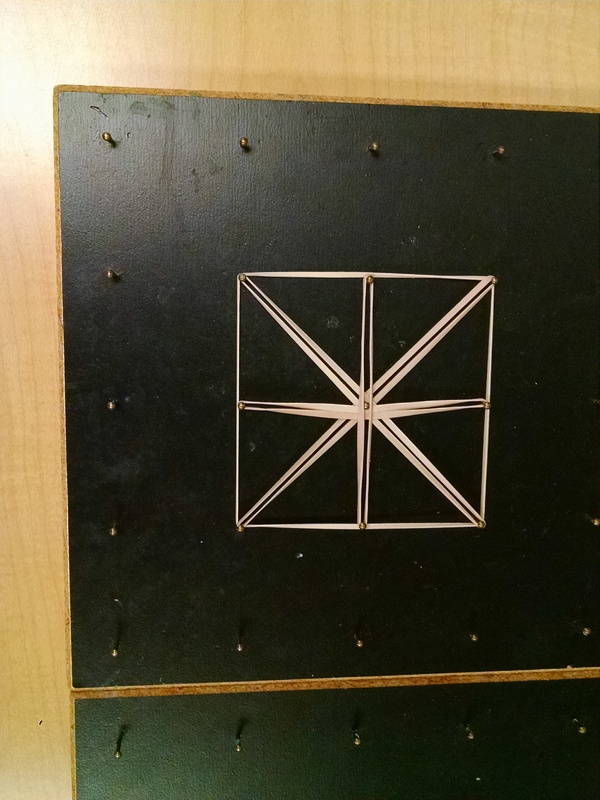 Geo-Boards: This are an easy “connect the dot” activity where kids fasten rubber bands on the nails on a board to make patterns. This ties in with the idea of looking up at the stars and connecting the dots to make constellations. Matching Game: You could also create a matching game, where some of the cards showed a picture of a pattern of stars without the constellation drawn, other cards show the lines of the constellation and others show the illustration of the constellations. Glow in the Dark Constellations: We demoed both the art projects they’d worked on and our Glow in the Dark books (see below). Tip for a successful demo: we brought a black light flashlight which we used to “turbo charge” the glow in the dark paints. You shine it on the book for seconds, and the book glows bright for minutes. We explained the basic concepts of stars and constellations, and showed a telescope and talked about how it could be used to study the stars. 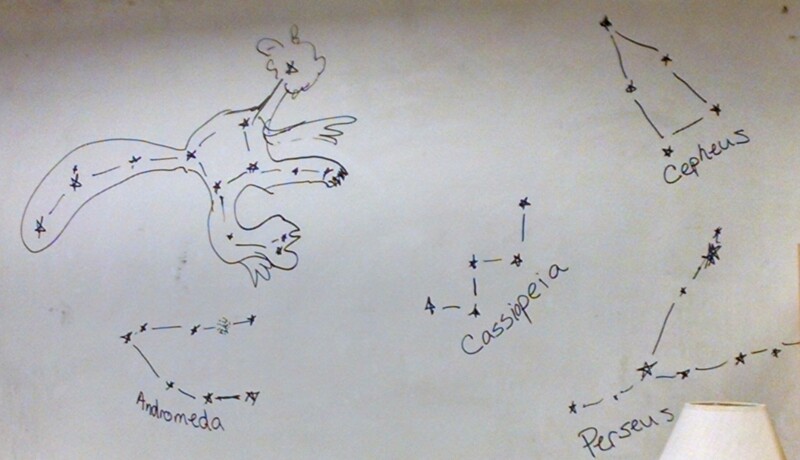 We talked about constellations – how members of ancient cultures “connected the dots” to make constellations and told stories about those constellations to make them easier to recognize and remember. Dramatic Play – We told a very simplified story of Perseus and Andromeda (see a full story here, or listen to a podcast children’s story telling the tale from Andromeda’s perspective.) 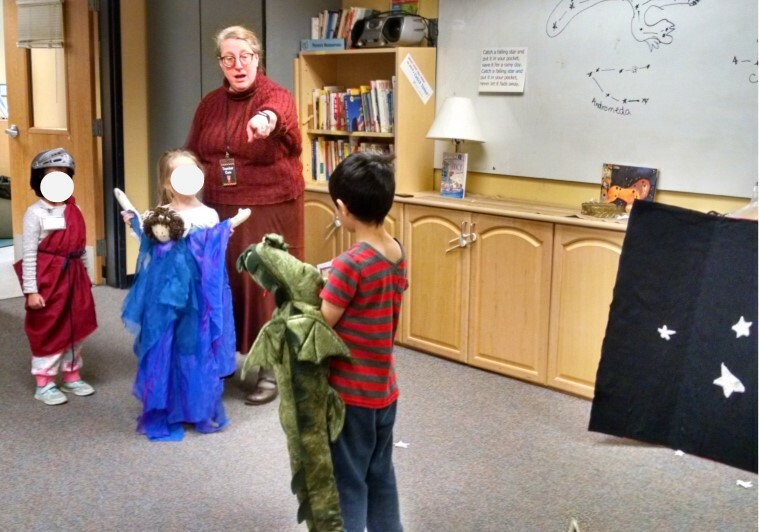 We had a serpent puppet, an Andromeda puppet, and a Perseus costume, and children could take turns acting it out. Rhyme: We taught the rhyme “Star Bright, Star Light, First Star I See Tonight. Wish I may, wish I might, have this wish I wish tonight.” Then we asked them what they might wish for. Book – Stars by Mary Lyn Ray. We said we’d talked about the science of stars, now we were going to talk about the magic of stars, and how people throughout history have thought about them as magical and special. 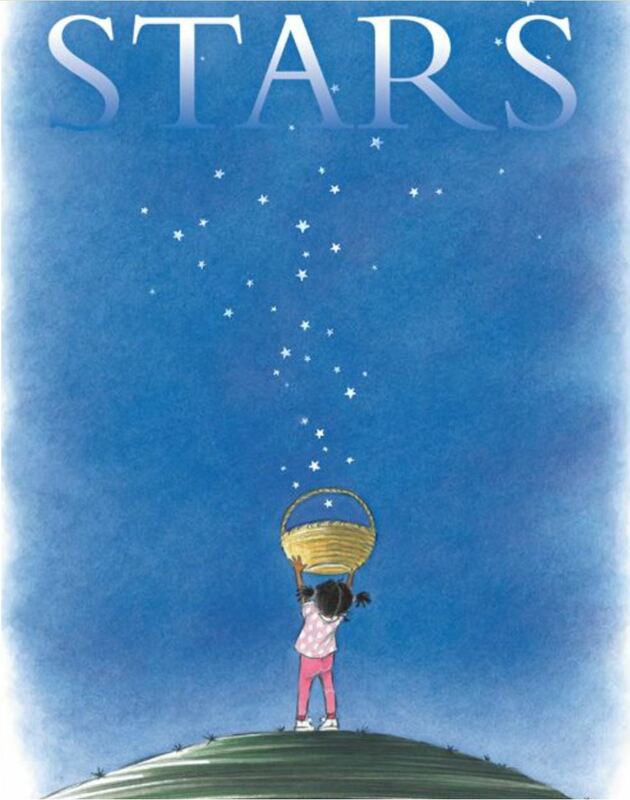 We read this book which is a fanciful story of making a star to keep in your pocket. Song – Catch a Falling Star: We taught the chorus of “Catch a falling star and put it in your pocket, save it for a rainy day. Catch a falling star and put it in your pocket, never let it fade away.” Then, we put on the music (using this YouTube video), and blew bubbles, pretending the bubbles were falling stars they were trying to catch. (A couple minutes of catching bubbles is always a hit with this age group!) You could also make “comet streamers” by tying plastic ribbon onto wooden rings, and dance around with those. Oral History: If you’re home schooling, or teaching a program where you see children several times during one theme, this would be a great activity: Read child(ren) a constellation story. Then have child(ren) tell the story back to you. Or have a group of children make up a constellation story. During the week, have children re-tell it over and over. At the end of the week, see how the current tale relates to the original. 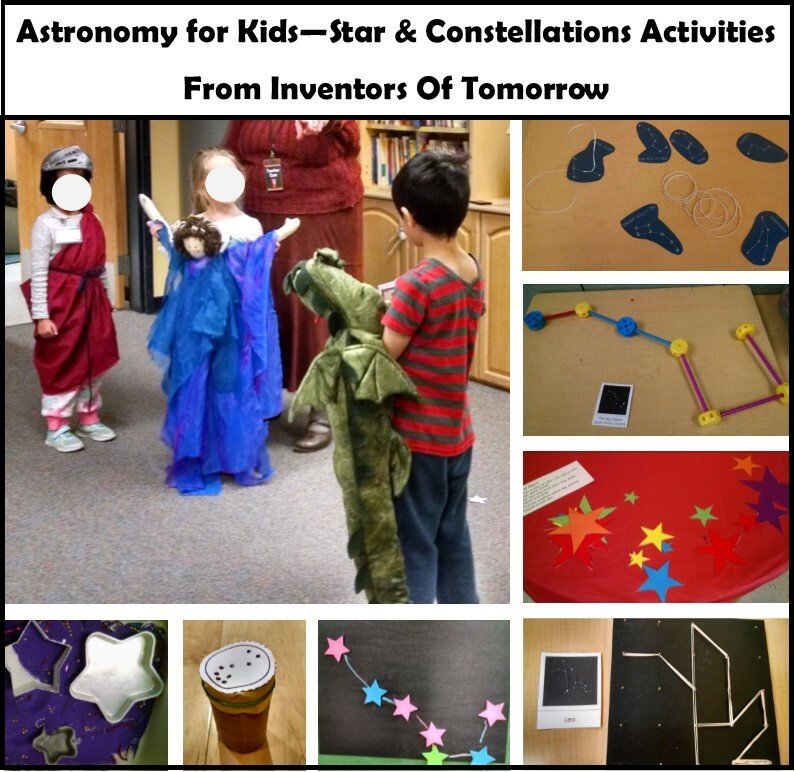 Idea: http://www.lpi.usra.edu/education/space_days/activities/constellations/storytelling.pdf. 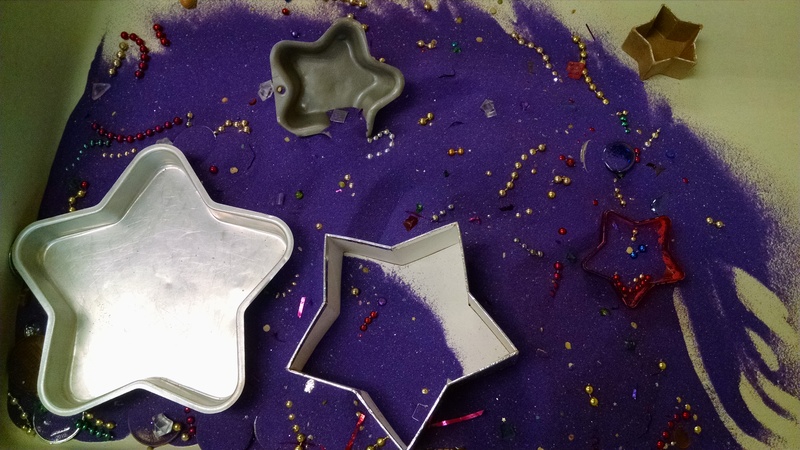 For more star activities that work for ages 1 – 5, check out my Fun With Toddlers series post about Stars and Moons. Our Stars by Rockwell. I think this is a perfect book for circle time for 4 – 6 year olds – it’s a nice overview of everything you need to know about space and astronomy. My husband has quibbles with some of the details (like where it says “I can see billions of stars” which is more than you really see, or where it says “when you see Orion in the sky… it’s the season to harvest” – he thinks it needs to specify when you see Orion in the EVENING sky, as you can see it later in the night or early in the morning at lots of times other than harvest season) but I think the overall quality of the book outweighs these little things. The Sky Is Full of Stars by Branley (an expert astronomer) is another very nice overview of astronomy and constellations, and I really recommend it for a 5 – 7 year old. But it’s long, so not a circle time book. The Big Dipper (is also by Branley and is quite a nice introduction to star gazing and constellations, with focused attention on one – the Big Dipper. I like this focus, because I think it would then be easy for you to find the Big Dipper with your child within a few days of reading this book and they’d have the excitement of recognition. Appropriate for circle time (engaging and short) for ages 3 – 6, or kindergarten age. Once Upon a Starry Night: A Book of Constellations and Zoo in the Sky: A Book of Animal Constellations , both by Mitton are very pretty books. They show the stars of constellations as part of a fully illustrated image of what that constellation represents, and has a very brief version of the story that goes with the constellation – not informative enough to be your only book on the topic but pretty enough that you’ll want to look at it! Look Up! : Henrietta Leavitt, Pioneering Woman Astronomer by Burleigh. A great story about a female scientist in a time when women were not expected / allowed to be scientists. For age 5 – 7. Constellations: A Glow-in-the-Dark Guide to the Night Sky by Sasaki and Glow-in-the-Dark Constellations by Chewning. Sasaki is mostly the mythology of the constellations, Chewning is mythology and science. Both are good guides in general, made especially fun by glowing in the dark. (Check out the black light tip above for how to quickly “charge” these books. How to Catch a Star by Jeffers. I really love this book (as I loved Stars – described under circle time) for it’s imaginative / fantasy feel. There’s a boy who loves stars and wants one to put in his pocket. He tries and tries to reach it, then gives up, then a sea star washes ashore for him to carry. Pretty, elegantly simple illustrations. I think this would be a good circle time book for ages 3 and up. My five year old found it delightful as he understood that there was no way the boy would get a real star, but then it was fun when a different kind of star came to him.